“Retired? Retired from what? 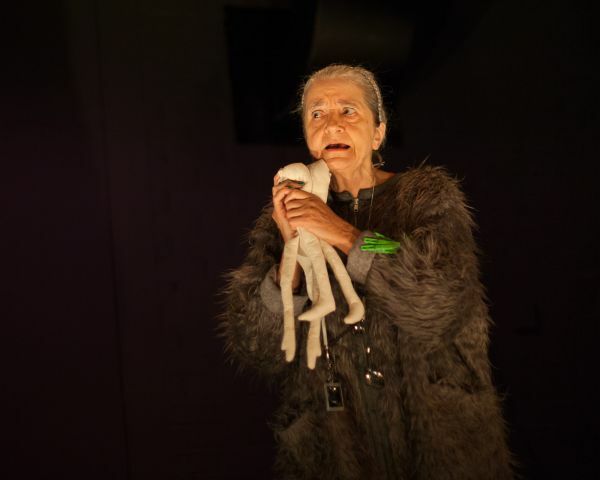 Life?” All This Living is sharp, defiant, surreal story-telling about how to negotiate old age in a culture where elderly females are stereotyped as burdens to be patronized, whose only importance is as a market for anti-aging products. 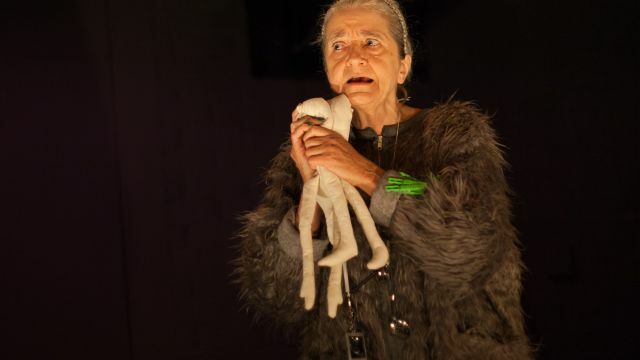 One of the Canberra arts scene’s most familiar performers, Camilla Blunden explores old age as a new phase of life to be negotiated. Having arrived at this point seemingly suddenly, the character struggles with her sense of self. She does however know she isn’t the hopeless, helpless, invisible, pitiful person society would have her be. At the opening, the character lies on the floor, dressed in some sort of animal suit. What kind of animal she will be only becomes apparent as she makes her choice of identity towards the end. Surrounding her are five large pots (labelled “crack pot”, “old hag”, “potty” and the like). Under their lids are surprises and contradictions—old memories, urges and drives. There are fragments of older social identities that she has passed through, pegs representing these external labels adopted and then shed, and pills for the pharmaceuticals thrown at the elderly like sweets. T he sound design includes a voice booming from a speaker mounted above the set, which delivers various kinds of received wisdom from other cultures, perhaps even from our own culture but from less commercial times. The voice introduces alternative visions of older women, from the witch Baba Yaga to wise women and goddesses—cultural images where women command respect. The character uses these more positive images to fashion a response to her own aging, a way of being that defies the stereotypes and maintains her identity and self-worth. Ms Blunden as always is strong and engaging. Her protagonist isn’t immune from the physical and psychological effects of aging, but those pale into insignificance beside the indignity of the way the world now wants to treat her, as an asexual non-entity and encumbrance. How she finds a way to fight back is satisfying in the extreme. All this is told with humour, the jokes not so much laugh out loud as wry observations on situations women of any age will recognise. Suitable for viewers of all ages, but especially perhaps the arrogant young who might learn something.